The other day I saw an intriguing video entitled “Are all Europeans descended from Charlemagne?”. I had known that Charlemagne, who lived around the year 800 CE, was an ancestor of many royal and noble lineages in Europe, but the thought of him being a common forefather of many millions of people seemed impossible. Nevertheless, the video shows clearly that the farther back one goes, the more ancestors there are; the number doubles every generation. So, at generation one there is two ancestors (parents), at generation two there are four ancestors (grandparents) and at three there are eight (great-grandparents), and so on until you reach generation 40 (around 800 CE) where there are 1,099,511,627,776 ancestors. The number is vaster by far at 2000 years ago. The narrator points out that because there weren’t a trillion people living back in 800 CE, there is a very large portion repeated ancestors within that total number. The vast majority of people lived and married locally, hence the very high possibility of mild to moderate inbreeding, although within healthy levels. But it would only take one outsider intermarrying at some point to add so many more ancestors to one’s lineage, and this must have happened for most people, except (as the video shows) for those geographically isolated by mountains for example. The question then arises as to which ancestors matter most to us. If everyone was related to everyone else within a continent, if not the whole world, around 2000 years ago, how can we speak specifically of Hellenic, Gaulish, Germanic, or other ancestors. The answer here lies in one’s genetic makeup, which can also be backed by facial features. I may have several trillion ancestors 2000 years ago, but only those that lived within the areas in which my parents were born are most important to me, because there is direct indigenous descent. Facial features tell a wonderful story about ancient times. It is always interesting when we find a doppelganger somewhere suddenly or point out how a cousin of ours resembles us (I have such a cousin). But now that we have forensic archaeology, the possibility of seeing our ancient ancestors face to face is now a reality to be celebrated. 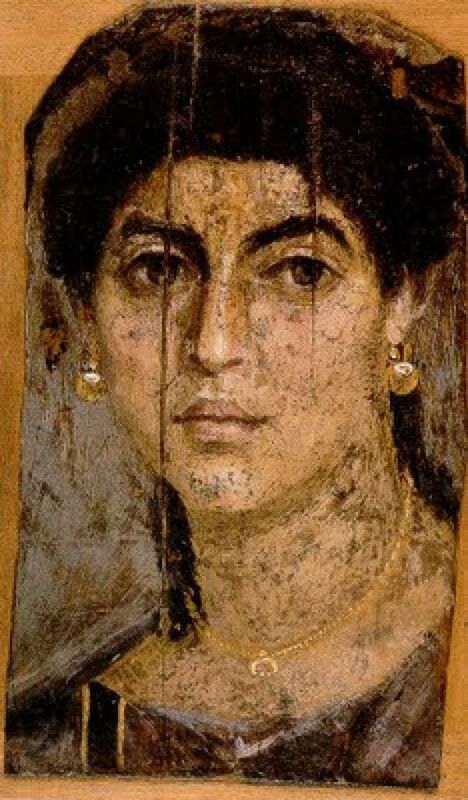 I remember, several years ago, when I first discovered the Fayum Portraits, I spent a whole hour or more looking through them and exclaiming every now and then: “I remember seeing that face somewhere!”. In fact, I showed a particular portrait to my dad, knowing who exactly it resembled, and I quizzed him on who it was (my dad and I have excellent visual memories and never forget faces). When he gave up, I told him it was an Egyptian workman who had carried rubble at our house once and then we shared a laugh! Another one, resembling my dad’s mother to some degree, made him tear up. In the course of time, my curiosity drove me to discover more facial reconstructions from the past. 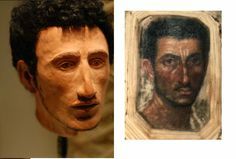 Because the number of these are still very scarce, especially from ancient times, I was absolutely dumbstruck and overjoyed when I found not only one but two facial reconstructions that resembled my father, and both derived from his ancestral lands, Greece and the Near East/North Eastern Egypt. The Greek reconstruction is of a Mycenaean noble warrior from Pylos who lived 3500 years ago and the Near Eastern face is a reconstruction of an average Canaanite/Jewish man from the time of Jesus. See below for the remarkable intermediate resemblance. It’s needless to say, my dad was quite glad, but (not being too fond of history) not as much as me! This entry was posted in Personal news, Uncategorized and tagged ancestors, ancient history, facial reconstruction, indigenism, polytheism on April 21, 2019 by Melas the Hellene. 1-As a devotee of Zeus, among other Hellenic Deities and Divine figures, I wrote the last article in honor and vindication of Dionysos, who is a Son of Zeus. May I be blasted by the thunderbolts I adore and damned in the underworld I fear if my intentions were not meant for that purpose as well as the common good. 2- It is extremely important to avoid cultural appropriation: If one is not Greek, has no Greek ancestry or comes from a land not historically settled by Greeks, they may pay homage to Dionysos as guests (visiting a friend, visiting Greece, etc. ), but to become devoted followers to Dionysos (or what is worse, priests) is unfair to the Greeks, and unfair to their own ancestral Gods. Perhaps the worship of the Roman God Liber (the counterpart of Dionysus) could extend beyond Italy, although I believe that would also acknowledge Roman imperialism. Polytheism is an ethnic mode of religion; tradition and ancestry and pantheon are all connected intimately and inseparably, a rule not made by any man but established by history itself. Don’t be tricked into thinking that a God entirely foreign to your ancestry and ethnic culture can really “call you” to his service. Only ancestral Gods call us, through the blood of our ancestors, and everything else is personal desire and cultural appropriation. If your ancestry in Celtic or Germanic, do not worship Dionysos as if you were Greek, because he had no connection to your ancestors; you should honor your ancestors by worshipping mainly their Gods. This rule applies to everyone. This entry was posted in Good and bad polytheists, Personal news and tagged Bacchanalia, Bacchic mysteries, Bacchic orgies, Dionysus, Homeric Hymns on November 8, 2017 by Melas the Hellene.